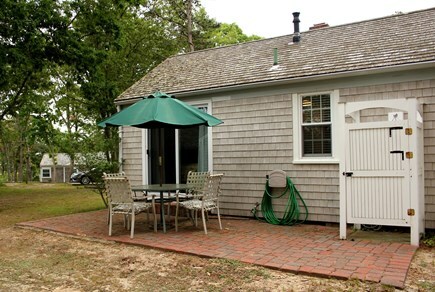 Franklin Cottage. Pristine inside and out. Living Room is comfortable w lg flatscreen tv and ocean views. Master Bedroom has a queen size bed, sliders onto brick patio. Master Bedroom plenty of closet and drawer space. 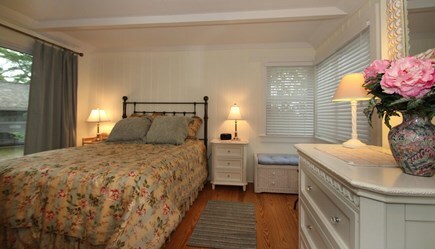 Bedroom has twin beds and is tastefully decorated. 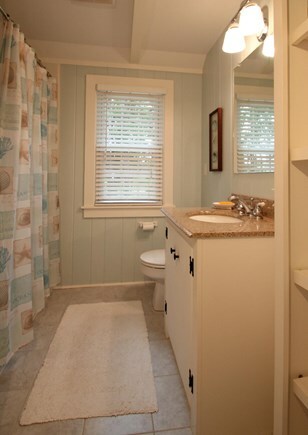 Bathroom has wshr/dryer, tub with shower. Redone recently. brick patio w/outdoor shower. Enjoy your morning coffee here. 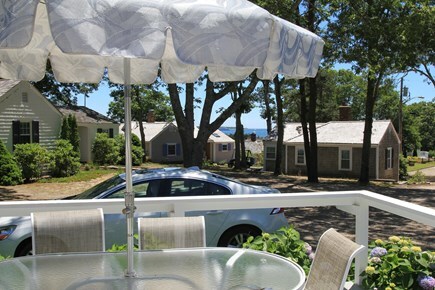 Large deck with ocean views comfortable furniture, gas grill. 17 acres of natural beauty. A true representation of Cape Cod. 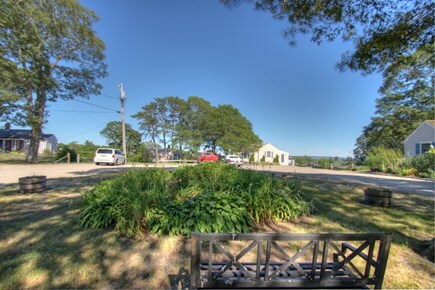 Our Entrance In Hyannis Port. Walk to quaint village of HPort. Comfortable 2 bedroom house with an ocean view. Sit on the front deck in the comfortable outdoor furniture and relax. 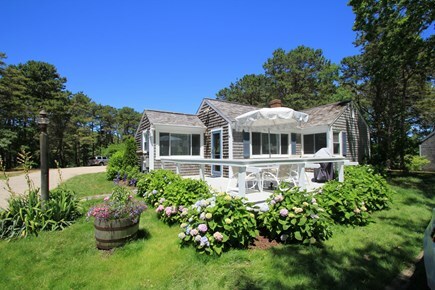 You will be surrounded by colorful hydrangeas and enjoy the ocean views from here. A great spot to barbecue on the gas grill, enjoy a cocktail, or read your favorite book. There is also a rear deck with outdoor shower and more comfortable furniture. Keyes Beach is a walk away via a footpath. 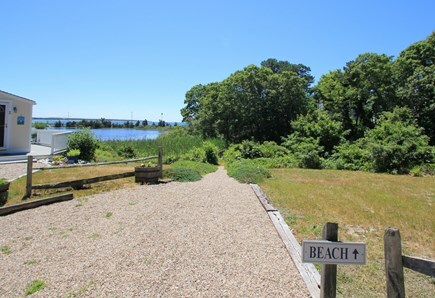 Located 1 mile from downtown Hyannis and the Ocean St docks. 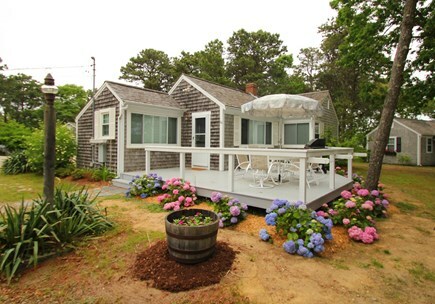 Brouse through the many gift shps or enjoy fine dining at one of the many restaurants located in Hyannis. 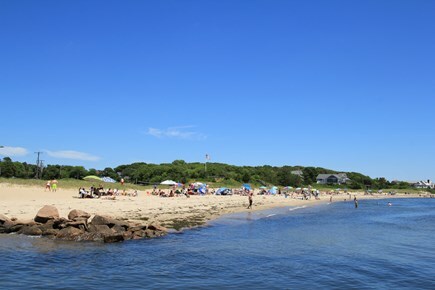 The historic Village of Hyannis Port is just a short stroll away. Less than a mile to the Melody Tent and Conference center. Onsite mmgmt. Towels and linens provided.